Using chalk, mark the back wall of the shelf by drawing a straight line to determine where you would like for the shelves to be. Remove the shelves and backing from the shelf and lay them flat on the covered surface. Wipe down all surfaces until they are dust and dirt free. After reading product label for proper application and safety instructions, apply single coatings of Krylon® COLORmaxx™ in white to shelves and table legs. Repeat every 10 minutes until you reach desired coverage. Apply painters tape to the back of the shelf on the chalk lines. Each section needs to be sprayed individually therefore, cover the other two sections with craft paper when spraying each section. To create an ombre effect, apply 2 coatings, starting with darkest paint and ending with lightest. Plug in iron and heat on cotton setting. Measure and cut enough wood edging to cover all four sides of plywood table top. Place the adhesive side of the wood edging onto the edge of the plywood. Run the iron over the edge until the edging adheres. Carefully, trim excess edging using a razor. Apply two coats of Krylon® COLORmaxx™ in Gold Metallic to table top. Repeat every ten minutes until you get desired coverage. Place each basket face down on the covered surface about two feet apart. 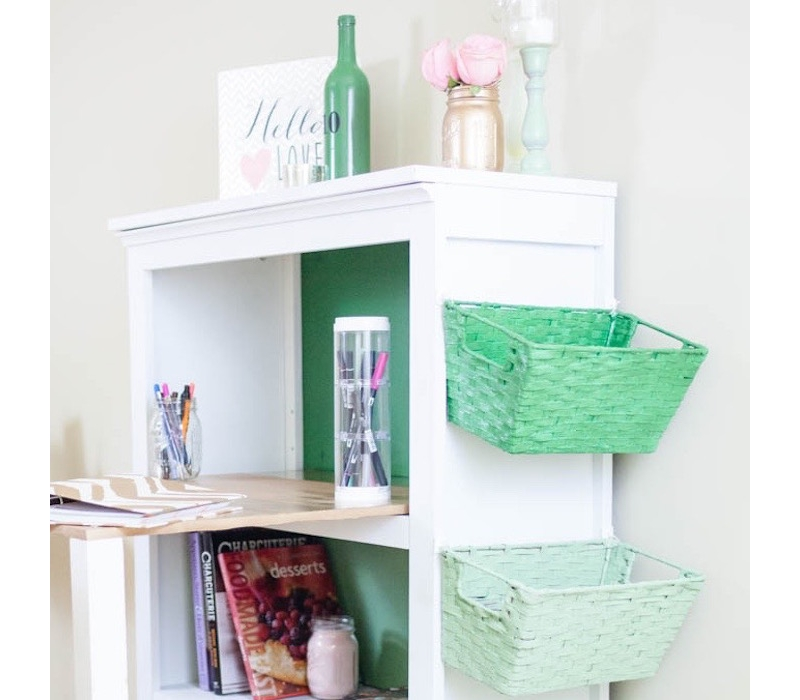 Spray one coat on each basket: one basket using Seaweed, one using Seaside Green, and one using Pistachio. Repeat coats every ten minutes. Once you have achieved desired colors on the baskets, flip them over and repeat step 11 for the interior of the basket. When going to assemble, place the shelf backing inside of the bookshelf before screwing the shelf backing on. Using your power drill and screws, screw the table top onto the top of the table legs. Place the tabletop on the shelf to create the desk. For extra support, screw the table top into the shelf. Add the baskets to the side of the shelf by hanging them with adhesive wall hooks.